Eye surgeons at the SMHS Hospital in Karan Nagar, Srinagar, have just performed three successful corneal transplants. Amazingly, all of the formerly blind patients that were operated on can now see clearly. Rajesh Sinha, a cornea specialist from AIIMS New Delhi, was the head doctor on these three complex eye transplant surgeries. A group of eye surgeons from the SMHS Hospital's ophthalmology department helped Dr. Sinha with these operations. The patients who received these corneal transplants were all over 50. Two of the patients were men and one was a woman. One of the patients, Mohammad Maqbool, couldn't see at all before the surgery. He told reporters that these surgeons literally gave him "a new life." When the doctors removed the eye bandage on another patient named Zoona, she reportedly shouted, "Al-ḥamdu lillāh" (Arabic: الحَمْد لله‎‎), which means, "Thanks to Allah." These corneal replacement surgeries were made possible by generous donations to the eye bank J&K. 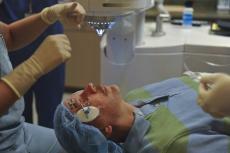 Eye doctors hope this is the start of better corneal transplant treatments in SMHS Hospital. A few of the doctors from SMHS's ophthalmology department who helped with these surgeries include Professor Tariq Qureshi, Dr. Umar, and Dr. Shahnawaz. All eye doctors at SMHS are working hard to strengthen the J&K donation center so they can perform more successful corneal replacement surgeries throughout the year. Professor Qureshi, who also serves as the head of SMHS's ophthalmology department, told reporters they see hundreds of patients who have corneal issues annually. Unfortunately, the hospital can't operate on all of these patients because it doesn't have enough corneas in their donation bank. Dr. Qureshi, however, is hopeful that the J&K will only grow over the years. As of today, many locals seeking eye care now travel to hospitals outside of Srinagar for a transplant procedure. Many spend hundreds of thousands of rupees on these corneal transplants in other states. When interviewed, Dr. Sinha said these three procedures were a great start, but Srinagar authorities still need to spread awareness of cornea donations. Dr. Sinha said, "The sustenance of this initiative will depend on the eye donations and banking." The only way J&K can survive as an eye bank is if more locals agree to become cornea donors. To encourage locals to become an eye donor, Dr. Sinha said, "Let your eyes live after you are gone." The full name of the SMHS Hospital is the Shri Maharaja Hari Singh Hospital. This hospital was founded in 1959 and serves as both a multi-specialty hospital a school for medical students.